Had until the 15th of the month to get out of the apartment and on the road. Steps 1 and 2 were to get everything into storage and modify the trailer for the trip. Removed the ‘mast head"’ from the trailer and the wood floor(replaced it with a plastic & mat floor. This made the trailer lighter. Also replaced the old 4 foot patio box with a 5 foot one. The new box is not only longer but deeper too, and comes with an installed lock clasp. For now a defunct cooler is serving as a second ‘dry box. 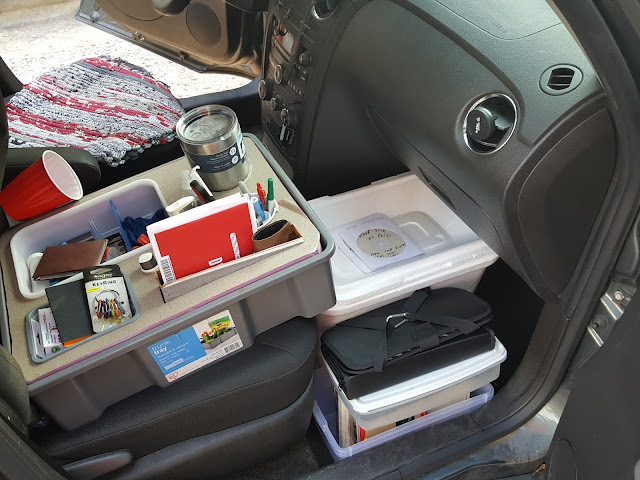 My custom made car ‘caddy’, my office: cooler and books on tape and music on the floor, car caddy on the seat.